Chester County District Attorney Tom Hogan discusses the launch of a Narcotics Overdose Prevention and Education (NOPE) chapter in Chester County. Two outcomes are likely for those who become addicted to heroin: They will overdose and die immediately or become addicted and kill themselves slowly, Chester County District Attorney Tom Hogan said this week. Responding to the growing epidemic, Hogan released statistics about heroin overdose deaths and use in Chester County, noting that the county is taking a proactive, multi-faceted approach to combatting the problem. The District Attorney’s Office and the Chester County Coroner’s Office worked together to create an overview of heroin-related deaths in Chester County, Hogan said. 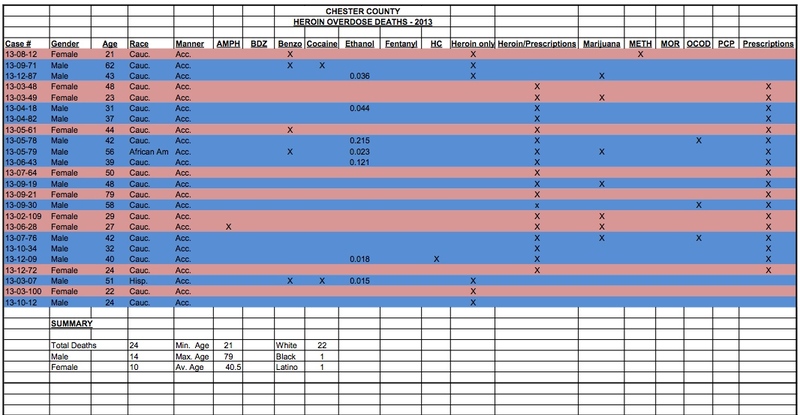 This information has never previously been compiled and centralized for Chester County, he added. In 2013, 24 overdose deaths occurred in Chester County where the deceased – 14 men and 10 women, ranging in age from 21 to 79 – had heroin in their systems. The racial breakdown was 22 Caucasian, 1 African-American, and 1 Latino. Out of the 24 deaths, 18 deaths involved both heroin and prescription drugs. Hogan, who chairs the High Intensity Drug Trafficking Area (HIDTA) strike force, a joint federal and local law enforcement regional program to combat drugs, said officials have learned prescription drug abuse provides a gateway to a heroin overdose: People start by using prescription drugs like Oxycodone, then switch to heroin because it is cheaper and easier to obtain. HIDTA intelligence has tracked heroin laced with fentanyl – a powerful opiate linked to more than 20 overdose deaths in western Pennsylvania – to suburban Philadelphia, he said, noting that the heroin was stamped “BAD NEWS.” Although no fentanyl-laced heroin has been found yet in Chester County, officials fear it will surface. In addition, Hogan said HIDTA intelligence revealed that while Philadelphia is known as a leading source of pure, cheap heroin, 80 percent of non-Philadelphia heroin arrests were for defendants from suburban Philadelphia counties: Bucks, 30 percent; Delaware, 21 percent; Montgomery, 20 percent; and Chester, 9 percent. Andy Rumford, who lost his 23-year-old daughter, Kacie Erin Rumford, to a heroin overdose last year in Kennett Square, channeled his grief into creating Kacie’s Cause, a nonprofit dedicated to eliminating such tragedies. Rumford and members of his team have organized town-hall meetings, set up support groups, and disseminated flyers. More information on his effort can be found at www.kaciescause.com. Hogan said the county is also working with a group of health-care providers to start a Narcotics Overdose Prevention and Education (NOPE) chapter in Chester County. 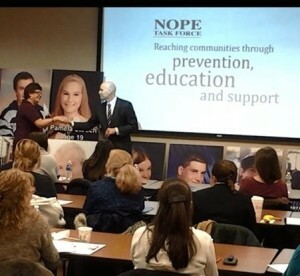 NOPE is an organization that works to prevent drug abuse through education, family support, and advocacy. The NOPE chapter of Chester County is now forming, supported by an initial grant of $5,000 from the Chester County District Attorney’s Office, Hogan said. Anybody who is interested in joining NOPE or getting more information can contact Beth Mingey from Holcomb Behavioral Health System at 484-444-0412.